All North Shore trails begin here. Water in the campground but the info kiosk has been destroyed by high winds 7-30-14. OVERVIEW - This route encompasses all the North Shore's major trails. The northern portion of the park has more ecological diversity compared to the southern portion. Pecan trees, the North Concho River, and more open spaces are just a few features which differentiate the two sections of the park. At the parking area by Bell's Trailhead and along Shady Trail, there are numerous pecan trees which attract squirrels and a colony of American Robins who live here year round. Evidence of beavers is present along the river although I have not seen one. As you walk along Dinosaur Trail, you'll see long rows of felled mesquite trees. Some years ago, there was a mesquite tree eradication project where the trees were cut down and laid in long columns to be harvested at a later date - some of those trees are now being harvested. About 3/4 of the way along Dinosaur Trail, you'll come across a normally dry creek bed. When you get to the kiosk, you'll see a fenced area. On the other side of the fence in the creek bed, are dinosaur tracks but thede tracks are not as clear cut as the tracks located in the Dinosaur Valley SP at Glen Rose. Water for horses and humans is available. Following the trail, you'll walk through mesquite trees and then open areas until you come to the Big Hill. Climb it by following the rocky road, at the top is Bell's Cross where you can scan the area. Continue south along the road and you will come to the Badlands Trail. The trail is mostly dirt with some small rock but is very easy to traverse. Continue along this trail to the well marked River Bend Trail. Recommend hikers take the Horse/Hiker branch as it takes you in a more direct route to your ultimate destination. Follow this trail until you come to the junction of River Bend, Turkey Creek and Flintstone Trails. An information kiosk, canopy covered table and water are available. Departing along Flintstone Trail you are now heading ENE toward an area overlooking the North Concho River known as Cougar Outlook. You can get a good view of the river as well as the now dried lake bed. You will also see the marker for the Javalina Trail. Javalina Trail is easy to hike, mostly dirt and small rock although there is a spot fairly close to the beginning of the trail where you have to hike over large flat rocks. Near the end of the trail, you will connect briefly with the Lower River bend Trail for about 50 meters then you will see a gravel/dirt road and a post for Lower Ghost Camp Trail. This trail will take you through two ghost camp areas that are not used. Continue on the trail and you will run parallel to a small creek that may have water by a concrete boat ramp (no longer used). You are now at the River Bend Campground which has a dry toilet, info kiosk and water. This campground is used on a few occassions but not too often. At the end of the trail you will come to a gate and on the other side is the sign for South Slick Rock Trail. Be advised the dirt and rock is very loose and it is easy to fall. At a certain point, you come to a branch, go right and it will take you down to the dirt road. If you go left or straight, you will be on the Upper Slick Rock Trail which will take you up and to Bell's Cross. If you follow the right branch, you will descend slightly and go down to a dirt road. Look about 100 feet away and on the right, is the Scenic Loop Trail post. The Scenic Loop wanders through pecan trees and gives you a view of the North Concho River. Watch for Great Blue Herons! At the end of Scenic Loop you come to another gate. Go through and follow the dirt road to the right. Maybe a quarter mile along the road, you will see the sign for Shady Trail and can see the path. Be careful going down the dry creek because the dirt is loose. Follow the signs to Shady Trail. 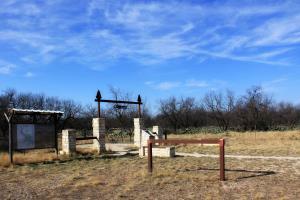 You will wander through a narrow trail above and alongside the North Concho River lined with tall pecan trees. Look for signs of beaver activity! The end of the trail is at Bell's Trailhead. (1) Water for humans and horses is available at the Dinosaur Trail track area, the southernmost point of the River bend Trail and at the ghost camp of River Bend Camp. (2) Some of the official State of Texas Longhorn Herd are at San Angelo State Park. They are moved from place to place to graze and you may encounter them while hiking. PLEASE close all gates you pass through and do not disturb the animals; especially if there are calves around. (3) Some trails in the park have separate paths designated Bikers and Hikers, Horses and Hikers or Multiuse. These paths may run parallel to each other and some will join for certain distances. Use the path designated for your mode of travel - there have been incidents of bikers and equestrians being on the wrong path which have caused discord. The park has informed everyone they will enforce the rules and fine offenders who use the wrong path. (4) Prior to coming to the North Shore, visit the South Shore park station and buy a laminated satellite view map of the park. Cost is $3 and well worth it. (5) Suggest you stock up on water prior to the hike and you always stop to refill your water carrier at every opportunity - especially in the Summer as the temps can easily reach the 100's. (6) The park is large and has numerous trails and roads that can be hiked, biked or ridden on horse. Although the park advertises having over 50 miles of trails, you really can't get lost. The park is bordered by FM 2288 on the West edge and the dried lake bed on the East edge. The park is approx eight miles in length from North to South.